Workshops and training courses facilitated by foreign partners has become a good tradition in MSU. " On September 12th-13th Mariupol State University together with representatives of Friedrich Naumann Foundation for Freedom and Academy of the Ukrainian Press held a workshop "How to write about economics understandably”. 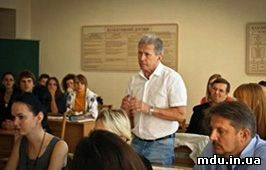 Correspondents and editors, lecturers in journalism from Donetsk, Lugansk, Melitopol, Rovno, Berdyansk and Mariupol as well as MSU students majoring in journalism participated in the training course. Elena Bulatova – MSU Vice-Chancellor for Research, Miriam Kosmehl – Coordinator of the Project "School of Social Journalism in Ukraine and Belarus” (Friedrich Naumann Foundation for Freedom), and Professor Valeriy Ivanov – President of Academy of the Ukrainian Press, made welcoming speeches to the participants. Florian Gassel – a famous German reporter, Ernst Schneider (Germany) – 2011 prizewinner for the best report on economic issues, and Ivan Poltavets – an economist and Headmaster of Kiev School of Economics were experts in the field of economic journalism. The participants of the training course got to know about the manipulations of statistics, the specific character of documentary sources of economic and business information surveys as well as about the peculiarities of genre presentation of economically biased texts. A special attention was paid to convergence, interactivity, multimedia and the role of social media. The participants of the training course actively participated in a role play "Press-conference” and made everybody glad about their theses on economics. At the time of the closing ceremony, all the participants were awarded certificates.